Mom knows how much us kitties like to get up on the tallest perch and look out over our kingdom! In our new living room, she picked out a perfect wall for us boys to call our own and started decorating it for us since it was crowned with a high window with a great view of Manhattan and the mighty Hudson River! Meow-za! 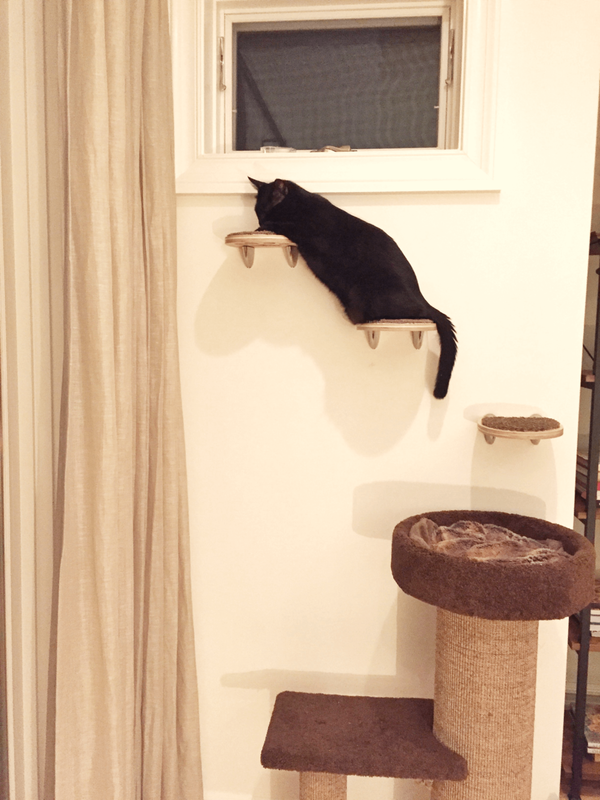 First, mom got us the Purrfect View double scratching post and bed for us to get a good full-extension stretch along our whole body! Beau and I have the best time chasing each other up and down and all around the post! Besides, it also works great as a snoozing spot for when we get tired from playing...which, believe it or not, does happen! We aren't as young as we once were...well at least I'm not. But after watching me jump from the top of the post up to the window, she noticed my back claws were digging into the wall on the way up...hmmm that's a no-no she said! So she looked for a solution that would make it easier for me to get my big bod up to the window while not damaging the new paint job! What are cat wall steps? She found the cutest wall-mounted steps from Purrfectly Catastic....they are hand carved with recessed PAW footprints on the bottom that are covered with nice low pile carpeting on top.....it makes it so easy now for me and Beau to prance our way up the stairs to our favorite window! We just love them! Mom says she is looking for some nice artwork and a couple photos of Beau and I to fully finish decorating our wall - can't wait to see what she finds! Let us know in the comments if you have any ideas...I'll be sure to pass them onto my mom! Until then, Beau and I have found a new game to play - who can make it up the steps the fastest! I, being the Alpha in the house, always gets first dibs, though! Meow! Which Flea and Tick Medication is Better for your Cat?